Thomas and George Gilchrist were from the lead-mining village of Wanlockhead in Scotland. Thomas Gilchrist was born 23rd Jan 1835 and George, 3rd Jan 1837 to Lead smelter, Hugh Gilchrist and Jean McCubbin in Wanlockhead. They had witnessed poverty and death amongst almost all of their family, children dying of typhoid and scarlet fever, and adults of pneumonicosis (caused by the inhaling of lead dust) and mining accidents. They arrived in Otago in 1862 on the 'Red Jacket' clipper ship, together with many miners from New South Wales. However the results below from the Goldminer's Database indicate that both Thomas and George Gilchrist were part of the goldrush to Gabriel's Gully, Otago, NZ the previous year, in 1861. Thomas Gilchrist took out his first Miner's Right there on 16th October 1861, and George Gilchrist two weeks later on 30 October 1861. In 1861, Thomas was about 26 years old and George two years younger at about 24.
issued on 25 October 1866 for the district of Hamiltons. the brother of Lowther Broad, the Gold Warden at Arrowtown. 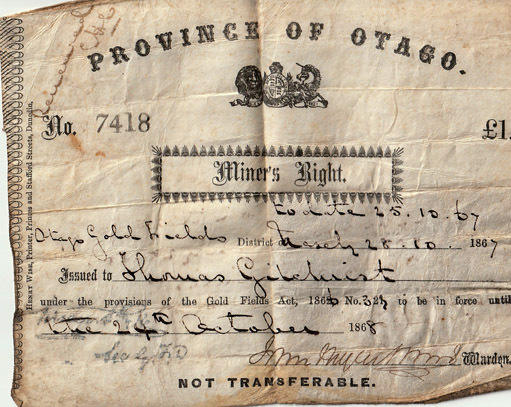 The Miner's Right issued to Thomas Gilchrist on the 28 October 1867 at Naseby in the Mt Ida District. Thomas and George then settled firstly in Hyde and then in Roxburgh. Thomas married Miriam Bowton, who died in childbirth with her second child, while George remained a bachelor. 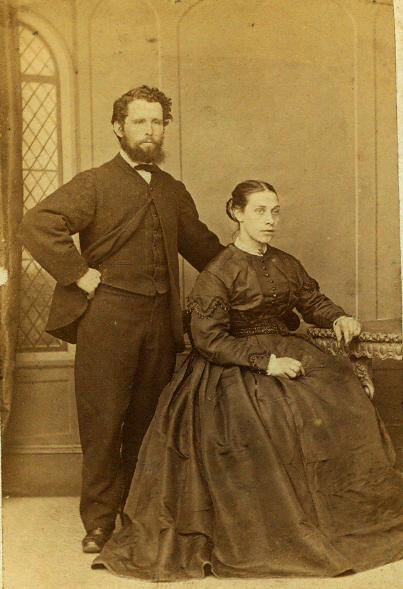 Thomas and Miriam Bowton on their wedding day, in 1868, 2 weeks after she arrived on the Schleswig Bride - a ship known to bring young hard-working women to NZ for the miners to marry. 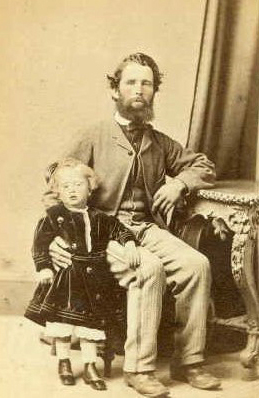 Thomas Gilchrist and his son George taken soon after death of his wife in childbirth with their second child. 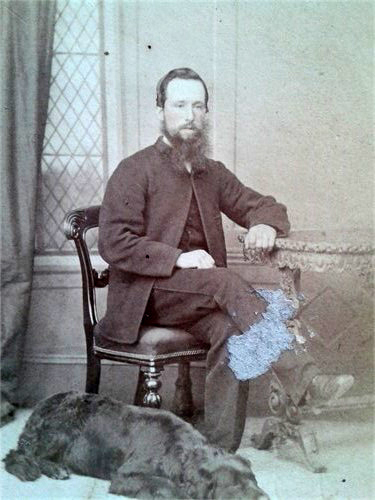 George Gilchrist, brother of Thomas Gilchrist. 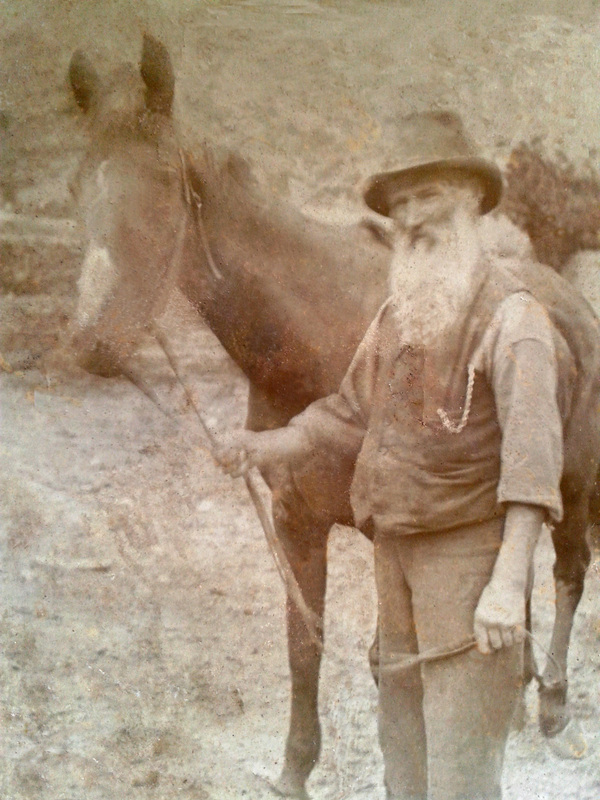 George Gilchrist (brother of Thomas) with his horse, Carlo. George Gilchrist, brother of Thomas. An excerpt from an 'Interview With Four Roxburgh Men 1948' in which George Gilchrist is talking about his father Thomas Gilchrist on Radio NZ. Radio NZ Interviewer: Mr. Gilchrist, Will you tell us about your father, how he first came to the district? George Bowton Gilchrist: My father came to Australia in 1861. Well he was in a party of 600 diggers who came over to NZ early in 1862 on a ship called Red Jacket. He carried his swag up to Roxburgh and on the way at a little place called Glenore, he met a chap that he knew in Victoria who gave him a job just to give him a few shillings to carry on with. All the money he had when he left Dunedin was 10 bob. So then he came up to Roxburgh, and he fell in with a chap named Tommy Miller, and they struck a little lair of pale blue wash face on the Roxburgh East side and he made a hand-barrow out of two manuka sticks and a sack and carried this wash down to the river bank and panned it off in a tin dish and um this, according to him, this averaged a penny-weight (of gold) to the hand barrow, every lot that came down. 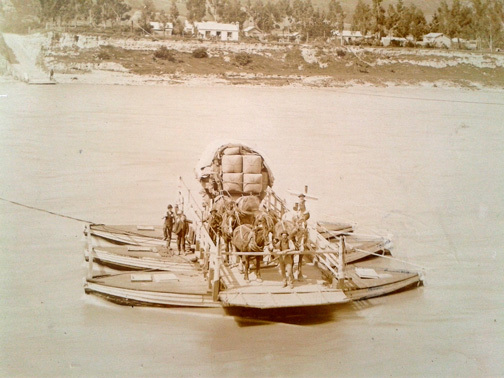 Well that night there was a flood and he spotted a cradle coming down the river so he rushed away down to a man that had a boat that he used to ferry passengers across the river and claimed it as his and he gave him 5 bob to go and pull it ashore and he worked for a time with this cradle. So after that, he left here and went in the? direction, the back of Naseby and don’t know, he was there for some time, don’t know if he did much good there but he and his brother and a man called David Syme. He was a cousin of a famous journalist, David Syme of the Melbourne Age; I think that was the name of the paper. They took up a claim at Hyde, the same size as Mr. Michelle has been describing –so many feet square, they got hold of the first bucket of wash, when they got hold of the bottom, they washed up, they washed 312 penny weights, so they worked out this piece of, this little claim, didn’t take long, and they did fairly well out of it and Syme, he went away to America and my Uncle and my father, they took a job under the honorable Thomas Fergus that was. He was an engineer for the provincial council in Cromwell. And from that on he never did any more mining after that. Then he started carrying. He finished up with that. Interviewer: When did he start carrying? What year? GB Gilchrist: Um about, what would he have been, he was about 78, about 1880 or 1881. … Between Lawrence and Roxburgh principally. Fellow Roxburgh Interviewee: Started carrying to Clyde first. Hmm?...He took cart with potatoes and things to Clyde, when he carted he started first dealing in potatoes and oats and carting them up country and then he started as a general carrier on the road. Interviewer: And what would he carry mostly? GB: Goods of all descriptions, merchandise and wool. Thomas Gilchrist and his carrying business on the Millers Flat punt. 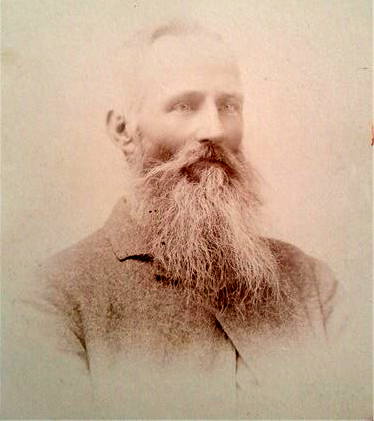 George Bowton Gilchrist, son of Thomas started an orchard in Roxburgh East and married Annie George, a daughter of another early gold mining settler family, Peter George and Rebecca Kennedy. They had 11 children. 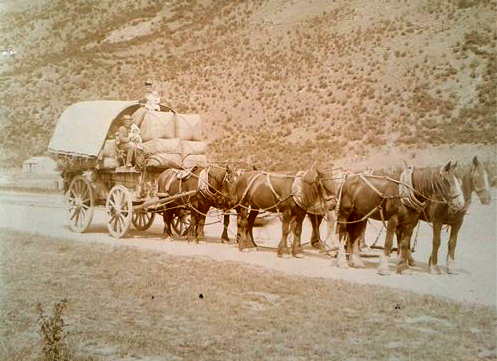 The son of Thomas, George Gilchrist and wife Annie George on wagon. Roxburgh Memories, #5604, Nga Taonga Sound and Vision website. THE GOLDMINERS' DATABASE at www.kaelewis.com. 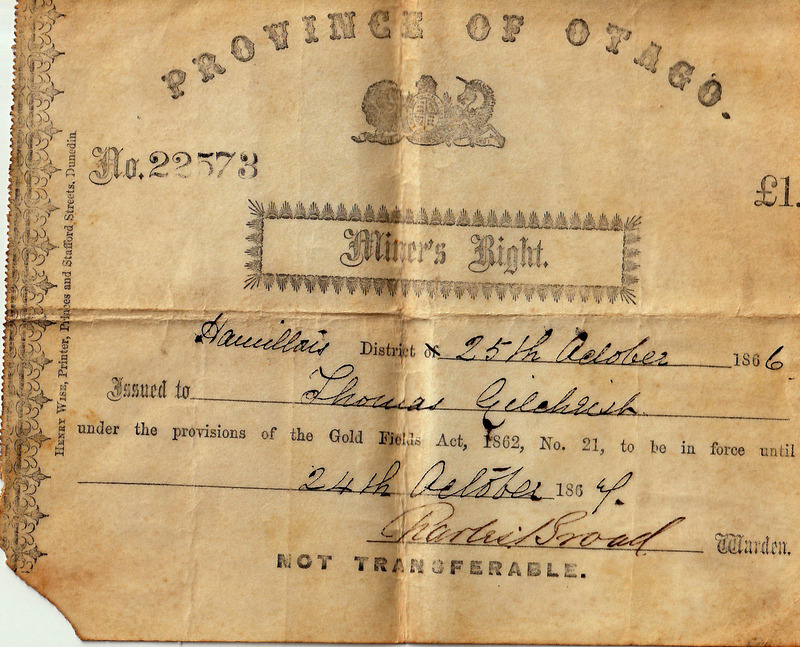 Miner's Rights Registration Book and Business Licenses, Tuapeka, Otago: Alexander Turnball Library Ref: qms-2045 Manuscript: 0713 (19 August - 1 November 1861).